Whatever platform you love playing games on, getting great audio into your ears is an absolute must. If you're running around the trenches of Battlefield 5, for example, it helps if you know which direction someone is shooting at you from. Only a great headset is going to offer the kind of surround sound - digital or otherwise - that gives you true 360-degree audio. And that's exactly what our favorite gaming headset, the Razer Kraken Pro V2 does. And right now, Amazon US is offering the Razer Kraken Pro V2 for just $49.99, down from the usual $79.99, and Amazon UK is also offering the brilliant headset for £49.99 down from £79.99. That's $30 / £30 off across both sides of the pond. Unlike a lot of gaming headsets designed exclusively for PCs or specific console brands, part of the Razer Kraken Pro V2’s appeal is that it’s compatible with anything sporting a 3.5mm headphone jack. So while it’s limited to a single method of wired connectivity, this headset is versatile in a number of different ways. In addition to embracing support for multiple platforms, the Kraken Pro V2 has a retractable microphone that’s convenient for those weekday evenings when you’re feeling especially hermit-like in your desire to shut everyone out. However, when you are in the mood for voice chat, the mic sounds pretty damn excellent all things considered. 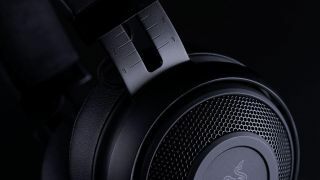 Although it’s not technically a “surround sound headset,” you can configure 7.1-channel virtualized surround sound for the Razer Kraken Pro V2 in the snake-laden company’s Synapse software. Enabling this functionality enhances spatialization even further, with projectiles audible from every direction. The 50mm sound drivers make for powerful noise unmatched by the Razer headsets that came before it. The first rendition of the Kraken Pro used 40mm sound drivers which, though still impressive, didn’t pack quite a punch in bass-heavy action games like Wolfenstein 2: The New Colossus. Our sole complaint about the Razer Kraken Pro V2 is that the earcups are circular rather than oval-shaped. The unfortunate truth is that most of us aren’t blessed with perfectly round ears, a fact that Razer itself is aware of. If you need a better fit, the good news is that third parties offer cheap oval-shaped replacement muffs that, when paired with the headset, still won’t set you back as much as the Kraken Pro V2 by itself at full price. It’s a deal for the decade. For more gaming discounts, might we suggest our roundup of the best Cyber Monday game deals of the year?